At the law firm of Beau Seaton Attorney at Law, we represent the people of Moncks Corner, South Carolina, when they are facing allegations of committing a crime. When clients come to us for representation, they gain an advocate with over two decades of experience and the ability, knowledge and skill to aggressively protect their interests in court, no matter what type of charges they are facing. MoreAt the law firm of Beau Seaton Attorney at Law, we represent the people of Moncks Corner, South Carolina, when they are facing allegations of committing a crime. When clients come to us for representation, they gain an advocate with over two decades of experience and the ability, knowledge and skill to aggressively protect their interests in court, no matter what type of charges they are facing. Along with criminal defense, we also handle issues of DUI. Because we understand how important it is for the people of Moncks Corner to know their rights immediately after being arrested for driving with an unlawful concentration or driving under the influence, we provide advice and representation quickly. Those who are going through family law issues such as custody and divorce also come to our law firm for representation, and we take on personal injury cases for people who have been injured at the hands of another, including those who have lost a loved one to another's negligence. Our representation is also offered to those in Goose Creek, Summerville, Manning, Santee, St. George, Holly Hill and Walterboro. Regardless of the type of legal issue our clients are facing, we are happy to offer the flexibility of credit card payments for our services. Without the right representation, even the smallest legal matters can quickly become huge obstacles that hinder the future of an individual. 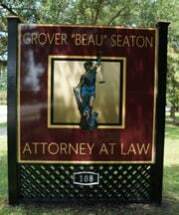 At the law firm of Beau Seaton Attorney at Law, we aid clients through difficult times with the help of a competent, qualified attorney.